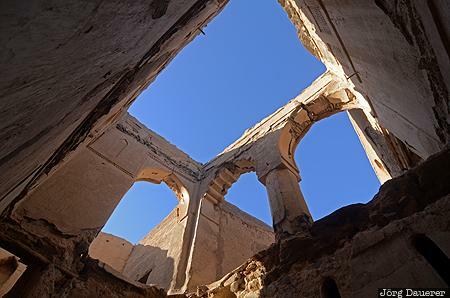 The decaying walls and columns of the second floor of a ruin in the old town of Ibra below a blue sky. Ibra is in Ash Sharqiyah in the Sultanate of Oman. This photo was taken in the evening of a sunny day in March of 2012. This photo is part of the exhibition Rust, Wrecks and Ruins (February 2014). This photo was taken with a digital camera.